Just this month, New Testament scholar, N.T. 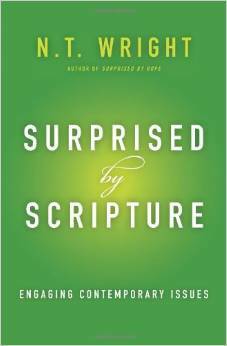 Wright, released his newest book to date: Surprised by Scripture. Wright continues to make more of his work available to a popular Christian audience, as opposed to his more weighty and academic works, such as his Christian Origins and the Question of God, currently a 4-volume and 3700+ page set (with 2 more volumes to be released at some point). First off, I want to offer a special thank you to Renee Senogles, Publicity Manager at HarperOne. She was kind to send a review copy a couple of months back. I always appreciate kind publishers willing to make copies available for free in exchange for reviewing them on one’s blog. Thanks, Renee! The book is somewhat unique as a published work by N.T. Wright. Rather than it being one solidly unified work flowing easily together, it actually contains 12 almost separate essays. Thus, I believe the book stands as somewhat distinct from his other 40+ published works thus far. The thrust of the book is summed up in its subtitle: Engaging Contemporary Issues. What Wright (or HarperOne) has done is to take varying public lectures he has given over the past 10 years and turn them into a book, all to address many important topics in our world today, at least within the popular Christian world (these issues have been discussed for decades in scholarly circles). I’ve personally read some of his articles, listened to some teachings, and watched some teachings online as well. But nothing has been in book-published format. I think that is worth noting. Of course, one cannot fully address these issues in a chapter, or in 3 chapters given to the issue of science and faith. But he does offer some thoughts around these 2 topics that are worthy of bringing to the table. I’d say the only negative of the book is that, because of its 12-essayed nature, you’ll easily note repetition on an idea or two. This is definitely seen as he addresses the problem of modern-day Epicureanism, via post-Enlightenment thought. By the final time this subject comes up in the latter part of the book, you’ll know Wright’s exact thoughts on the issue, so much so that you could recite it yourself on his behalf. The bottom line: If you’d like to have Wright’s published views on the 2 issues I mentioned above – faith and science; women in church leadership – it would be worth purchasing this book. That material takes up nearly 40% of the book alone. I believe all the other material has been discussed elsewhere in his other published works, such as Surprised by Hope and Scripture and the Authority of God. In all, N.T. Wright remains a voice for both the scholarly and popular realm. And his contributions in this book should be included as the popular (or non-scholarly) Christian world consider varying contemporary issues of today. This entry was tagged Bible, book review, books, N.T. Wright, Scripture. Bookmark the permalink.